Protein powder for a vegan? Yes or no? Whenever i post pictures using protein powder i immediately get messages asking if it is necessary to use protein powder as a vegan, so i thought i would answer it in a post once and for all. No, using protein powder isn’t necessary. This applies to everyone, meat eaters and vegans. So why do i use protein powder if it isn’t necessary? Because it is a cheap source of protein and a quick and easy snack to consume as post workout, but also because i personally love mixing it with my plain soy yoghurt. However the latest protein powder i bought wasn’t that great and mixing it with just water or oatdrink was almost impossible to consume, so instead i use it in my smoothie bowls or mix in with soy yoghurt so that it doesn’t go to waste. So first off, if you eat varied and enough and try to eat beans/lentils/soy everyday as a vegan then you should be getting enough protein. And if you are training alot and trying to build muscle then you will already be aware of “protein” and 1) be eating more because you are exercising and 2) most likely eating more protein rich foods as you are aware of your food and protein intake, so protein powder isn’t necessary, but of course it doesn’t hurt to consume it unless you have kidney problems. So eating varied and enough calories will more than likely cover your protein requirement, unless you are eating just plain white pasta, rice and potatoes… then you might not be reaching the required amount, but 0,8g per kg body weight is just an average requirement and you can still survive with around 0,4-0,6g per kg body weight… but that is not recommended as protein is important in your diet and in your body. Studies have shown that if you are strength training and trying to build muscle, then consuming around 1,1-1,2g protein per kg body weight does help/have it’s benefits, so it doesn’t hurt to consume protein powder even if it may not be necessary. (Source 1, Source 2) But like mentioned above, it is a cheap and quick source of protein and as a vegan it can be harder to reach a high intake of protein unless you are eating alot of beans, lentils, soy meat, tofu, soy drink etc The more you eat, the higher protein intake you have, so if you are only eating 1500kcal you won’t have as high protein intake as someone eating 2500kcal. 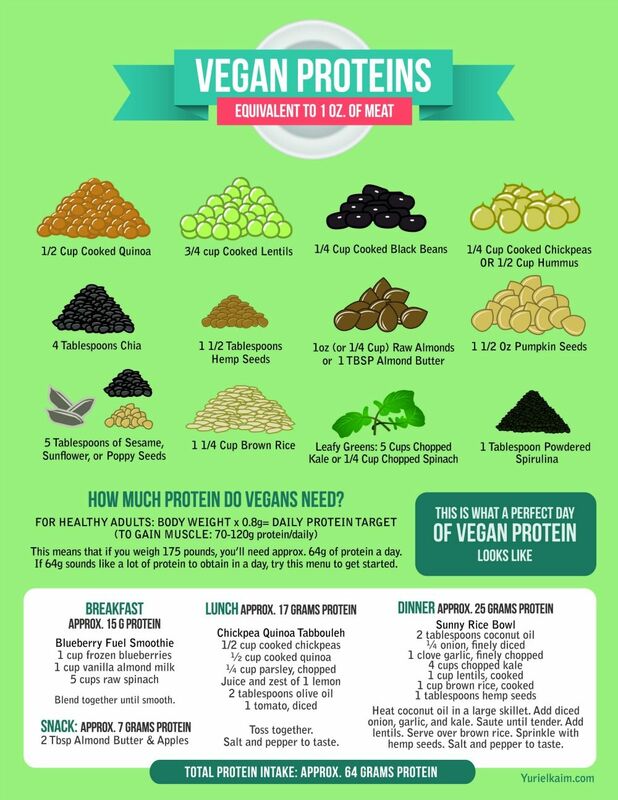 When it comes to vegan sources of protein, they are not always “complete sources of protein”, meaning that they don’t contain all 9 essential amino acids. However with protein combining that is no problem as well as a varied diet throughout the day and the week. But as much as vegans want to shout that broccoli and spinach and bananas are a great source of protein, that is not the case and comparing brocolli to steak isn’t an accurate comparison because they are completely different types of foods. (Read more HERE )Example raw broccoli has c.a 7-8g protein per 100kcal and steak around 11g protein per 100kcal, and to reach c.a 100kcal broccoli you need around 300g brocolli compared to only around 2-3ounces (?) of steak, and not to mention that broccolli doesnt have all the essential amino acids and would require you to eat ALOT of brocolli to actually get a decent amount of protein and enough amino acids for it to be complete. I am not dissing brocolli, it is a delicious food and has so many benefits but it wouldn’t be my first choice of food if i wanted protein. So protein powder yes or no? If you are working out hard, it doesn’t hurt to consume it, as long as it doesn’t take away from the other macronutrients i.e that you consume more than 20E% protein. (example, you consume 2000kcal a day then more than 100g protein may be unnecessary and take away from your carbohydrate and fat requirements). First and foremost, eat varied, eat enough, try to eat some grains, legumes, soy protein each day and you most likely don’t need to worry about your protein intake. Do you consume protein powder, yes or no? and why? Also if you want to read more, then THIS article is very informative. I actually bought my very first vegan protein powder a few days ago. Simply because don’t want to pay attention to food combining and stuff like that all the time. And since I’m looking to gain another 10kg to reach my minimum healthy bmi I think it’s important to get adequate protein especially since i choose to eat a vegan diet. So that’s why i use soy protein now 🙂 But considering i eat around 3000 calories a day it shouldn’t be really necessary haha. It’s just a convenience for me actually 🙂 And furthermore i totally agree with you on this! Especially if you don’t weight train you shouldn’t have to be worried so much i guess. It’s just for me that i weight train a lot as well as needing to gain weight so then it can be beneficial imo as i of course don’t want to be wasting my muscle. But you’re right about the fact that it shouldn’t hold you back from consuming enough fats and carbs! Yes, I think it would be great if you were to post more nutritional info like you have done about protein. The roles of different nutriants and why we need them is always useful to know – also knowing how much of one thing is needed. I love the article you included! Very helpful! I’m not vegan – but I am reducing my intake of meat to no more than once a day and sometimes none. I might go vegan one day as I’m intolerant to dairy anyway, but at the moment, this is a step in the right direction 🙂 One of the things I worry about is hitting protein – this was really helpful – I particularly like the diagram about 1oz of meat equivalent. I do have issues digesting beans though so I have to be careful which is one of the main reasons I wouldn’t go vegan right now! Thanks for the post!